The beautiful sounds of music have so much power over your emotion and soul. Think of what happens to your mind, body and perhaps even spirit when you hear a beat come on the radio. This power often inspires people to make a living out of music in one way or another. That said, it’s hard to get your foot in the door. If you’re looking to develop your own music production skills, there are a few things you should know. Read on to learn more! One of the best ways to get insider information about the industry is to meet with an actual music producer. Whether you visit someone at the local or national talent level, you’ll get to see what the life of a producer is really like and what the day-to-day happenings of the business are. Most towns have a local music producer, and he or she will likely be happy to meet with you for a brief interview. Be sure to prepare interview questions before you go – you don’t want to forget anything in the few minutes they found in their schedule for you. Knowing how to produce music is different from acquiring the latest skills, technologies and tools in the industry. No matter where you are in life, it would definitely benefit you to receive some formal training in the field. You could start taking classes at a community college or adult education center, or even obtain a music production degree from a university. Some music production programs might be shorter than the traditional college degree (or available in the evenings or on the weekends), which can be particularly helpful if you are a returning student. Once you have met with that music producer, be sure to keep his or her contact information on file. After you work toward receiving some education in the field, you may wish to contact the producer to find out if any internships are available. Remember, internships are generally unpaid opportunities to secure practical experience in the field. Your college probably has some internship opportunities available for you as well. Be sure to check with the career center and work on crafting an excellent resume to be accepted into the internship you want. Not everyone is going to have the time to spend each day on music production skills, but you really need to carve out time for it on a regular basis. You want to ensure that you have the best skills that you possibly can and that you are working on your mistakes. When you are at your internship or working with a professional music producer, be open to both positive and negative critiques. To put it simply, you are not going to learn if no one ever points out the mistakes that you make. If you’re looking to make it in the industry and be known to a large scale audience, your skills need to be practically flawless, so always look for opportunities to improve. Being a music producer is a dream that quite a number of people have, but most aren’t quite sure how to bring those wishes to fruition. When you follow the tips listed above, you are providing yourself with a greater opportunity to succeed in the exciting world of music production. Author Pam Johnson is a music production professional who obtained her Masters of Music Production from one of the most highly acclaimed programs in the country. Her job can be found on the list of Highest Paying Master’s Degrees. Larry Sparks admits that his music has always had a good, true and real lonesome sound. It’s not surprising that his 2010 release on the Rounder Records label is all about nostalgia, homesickness and sadness, along with a healthy dose of wistful longing for traditional values and days gone by. Besides Larry with his vocals and guitar, the supporting musicians include his son Larry D. Sparks (bass), Tyler Mullins (banjo), Carl Berggren (mandolin), Ron Stewart (fiddle), along with Jeff Brown and Don Rigsby each singing tenor on five cuts apiece. Larry Sparks’ signature sound emphasizes respect, honesty, transparency, faith and assertiveness. “Almost Home” is yet another chapter in Sparks’ tradition-based music that is direct and thought-provoking … a part of his legacy that has spanned nearly fifty years of professional music-making. his original music. His 2005 album included an illustrious cast of guests who were given plenty of opportunities to strut their stuff. I understand that his 2008 “Long Story” album also included an all-star cast. 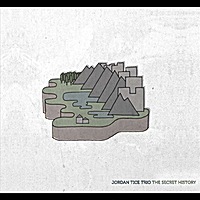 Now, Jordan Tice Trio’s “The Secret History” project paints its musical canvas with only Tice’s guitar, Simon Chrisman’s hammered dulcimer, and Paul Kowert’s upright bass. All three new acoustic pioneers display technically impressive moxie throughout the eight tracks. I hear fewer direct influences from folk, bluegrass, and jazz idioms that Tice explored in his early days as a player with Gary Ferguson and Sally Love, and bluegrass bands like “Foxes on the Run” and “Blue Light Special.” Instead, the trio’s music now takes on a unique personality all its own. “The Secret History” ebbs and flows like the tide, with dynamics that advance and then recede. Will the 5-7 minute tunes be given their fair due with adequate radio airplay? I certainly hope so. Jordan Tice received a full scholarship to attend Towson State University. A 2009 graduate with a degree in music composition, he now makes his home in Boston. His tone, timing, balance, rhythm and execution are extraordinary. He drives the original music with dynamic pronunciation, and the interplay of Chrisman and Kowert with him is phenomenal. On tunes like “Duet” and “Death and Spiders,” Kowert’s moaning low-end sounds almost ominous, and that may take a little getting used to. You might even adjust the equalization on your playing device. Yet he is always right on the money with his bass notes, whether plucked or bowed. A 2009 graduate of the Curtis Institute of Music, Kowert lives in New York and tours with Punch Brothers (featuring Chris Thile). Simon Chrisman has followed his muse by relocating from the northwest to Boston. Making a name for himself as a distinctive, evocative dulcimer player, he also tours with The Bee Eaters and Jeremy Kittel Band. 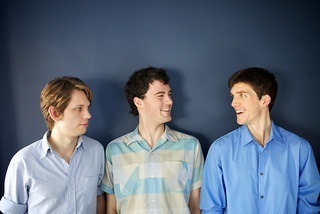 Collaboratively, the Jordan Tice Trio members are very well-suited and supportive of each other. It takes skill to flawlessly execute one’s own unique style while still presenting a tasteful, balanced, coherent, meaningful group sound. Tice once said the best way to understand bluegrass is just to “listen to it.” Close listening, reflection and study are good advice for this instrumental release, as well. Some of my favorite LPs from back in the old days were those double disc sets that showcased several professional bluegrass bands driving their sounds from the stage of a festival from Bean Blossom from McClure, Va. That’s why “Live at Graves Mountain” is a great sampling of music from the 18th Annual Syria, Virginia bluegrass festival on June 4, 2010. It also celebrates the 55-yr anniversary of Rural Rhythm Records, and the album captures a wonderful day of music and camaraderie among the label’s artists. Kudos go to audio engineer Gene Daniell who recorded the event. This album is billed as an “all-star jam” because each cut features one of the bands listed above with one or more special guests. For example, the CD opens with The Crowe Brothers on More Pretty Girls Than One along with guests Russell Moore, Sammy Shelor and Mike Hartgrove. It’s exciting to hear the like of Audie Blaylock, Lou Reid and Russell Moore tear it up vocally on a song like Once More. You can just hear the barn-burning excitement as fiddler Patrick McAvinue, banjo-player Evan Ward, guitarist Audie Blaylock, and mandolinist Wayne Benson step it up and drive the tune “Old Dangerfield” from Bill Monroe. Why, Matt Wallace even takes an outstanding bass break in the tune! That’s what bluegrass jamming is all about, son! 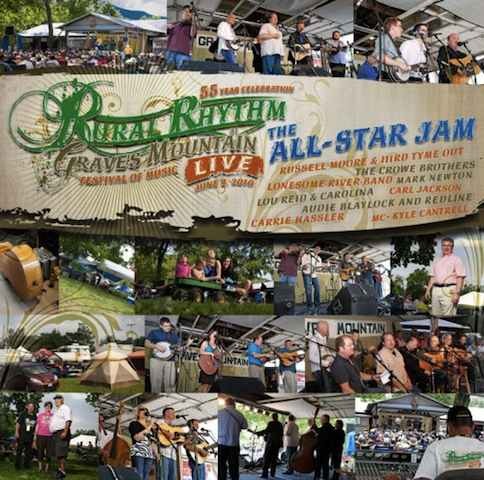 Three interesting cuts that capture the bluegrass spirit are “Graves Mountain Memories,” “Ground Speed,” and “Home Sweet Home” played by The Rural Rhythm All-Stars with Carl Jackson, Sammy Shelor, Wayne Benson, Mike Hartgrove, Mike Anglin, Brandon Rickman and others. Carl Jackson’s lyrics in “Graves Mountain Memories” provide the imagery to color the canvas from this beautiful, idyllic spot. He did a pretty good job of putting 400 years of history into a six-minute song. Jackson’s lyrics tell us about “more than the stars above the Blueridge, more than the blossoms on the apple trees, more than the rocks along the Rose River.” If you can’t personally attend this bluegrass festival in a place known for its tradition, history, fried chicken, fruit pies and friends, then you should pick up this album to fill your own heart with some Graves Mountain Memories. The award-winning Grascals’ Tribute to the Music of the Andy Griffith Show is a fitting way to celebrate the 50th anniversary of the television show which ran from 1960-68. In the show, The Dillards (Rodney Dillard, Doug Dillard, Mitch Jayne, Dean Webb) played The Darlings, a backwoods clan of musicians in the mountains near Mayberry, N.C. At the time, old-time and bluegrass music was often associated with hillbillies, and the music occasionally made its way into situational comedy. Despite the stereotypical connection, a show like Andy Griffith’s could be viewed as quite influential in introducing many throughout the nation to bluegrass music as Sheriff Andy Taylor and Deputy Barney Fife dealt with moonshiners, rock-throwing neighbors, and criminals from out-of-town. The Dillards were certainly on top of their game when performing on the show, even though they only appeared in six episodes (between 1963-66) and played a total of 14 songs during the show’s 9-year run. The music always generated large amounts of fan mail. There are classics from the show (Dooley, Boil Them Cabbage Down, Stay All Night (Stay a Little Longer), Ol’ Joe Clark, Leaning on the Everlasting Arms). 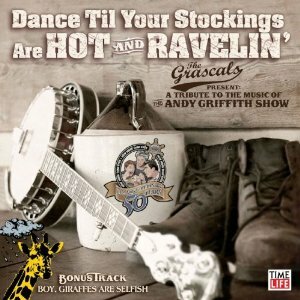 At Griffith’s request, The Grascals also wrote and recorded a short one-minute original song entitled “Boy, Giraffes are Selfish” that was inspired by a famous Barney Fife quote after a bunch of dogs were released in a thunderstorm. Barney Fife said, “A dog can’t get struck by lightning. You know why? ‘Cause he’s too close to the ground. See, lightning strikes tall things. Now if they were giraffes out there in the field, now then we’d have trouble.” Barney’s point was that giraffes are selfish because they walk around with their heads in the clouds and don’t take care of each other. The Grascals are familiar with many quotes from the television show, and they are known to resurrect a few now and then during their travels and shows. And who says a song can’t be written about nearly anything? The EP is a good conceptual idea, but it left me wanting more. I wonder if they were on a tight production deadline, and they only got enough material recorded for a 15-minute release. The Grascals do a good job with the old bluegrass standards, but they could’ve really infused them with new fire and life. Further, with only a few more songs, the tribute project could’ve been full-length album. With only a little more time invested, some fantastic new originals could’ve been inspired by the antics, advice and wisdom of the original Mayberry bunch. Remember the episode where The Darlings are discussing the song they are going to play at Charlene’s wedding? Briscoe asks, “How ‘bout ‘Don’t Hit Your Grandma with a Great Big Stick’?” Charlene replies, “No, Paw, That one makes me cry!” Now, in my opinion, there’s a great idea for a song just itchin’ to be written for an album like this. Or how about when Barney was asked to sing “A cappella”? Snapping his fingers in rhythm and singing “A cappella, A cappella,” he quipped, “Well, I don’t remember all the words.” There’s no question that the show was and still is “awesome family entertainment,” as Grascals’ guitarist Terry Eldredge describes it. To satisfy my lingering appetite, however, I reckon I’ll have to break out some DVDs of the old shows. 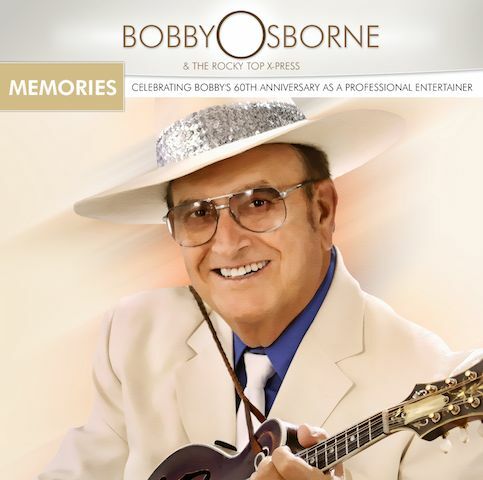 What a fitting tribute to Bobby Osborne’s 60th anniversary as a professional entertainer. In 1949, an 18-yr-old mandolinist from Hyden, Kentucky named Bobby Osborne started his pro musical career with banjo player Larry Richardson, Charlie and Ray Cline in a group called The Lonesome Pine Fiddlers. By 1953, Bobby and his banjo-playing brother, Sonny, were working with Jimmy Martin. With Red Allen singing lead, the Osborne Brothers formed their own band in 1955 and joined the Grand Ole Opry in 1964. While a CD jacket photo is included, the liner notes don’t clearly identify who Bobby’s “Rocky Top X-Press” band is, but credited musicians include Glen Duncan, Bobby Osborne Jr., Mike Toppins, Tim Graves, along with 1-2 tracks apiece featuring Patty Loveless, Russell Moore, David Grisman, Ronnie McCoury, Sammy Shelor, Audie Blaylock and David Harvey. It was apparently an oversight to not credit anyone for the prevalent drum tracks throughout the project, as well as bassman Daryl Moseley who is identified on Bobby’s website as a member of Rocky Top X-Press (since Dec 2001) and is also credited on this CD for writing “I’ve Seen It All.” Some research indicates that the drums were played by Harry Stinson. A highlight of the CD is Bobby’s duet with Patty Loveless on the title cut. With no plans to retire, Bobby Osborne continues to cultivate his polished grassified country music. With sixty years of entertaining under his belt, his reputation and legacy only continue to grow. 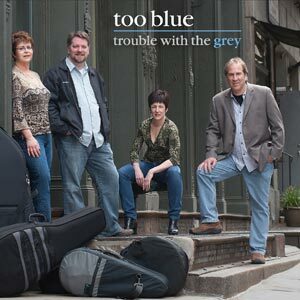 Too Blue is a quartet with members from the states of New York and Connecticut. They have plenty of focus in their personalized music inspired by bluegrass, swing, and country. By focus, I mean they have spirit, rhythm, technique, tone, taste, and discipline. They impart a lot of good balanced feeling by virtue of there being two gals and two guys in the band – Joan Harrison (banjo, vocals), Betsy Rome (guitar, vocals), Michael Sassano (mandolin, vocals), and Jamie Doris (bass). Joan and Betsy confidently handle lead vocals, and their relaxed vocalizing together is always smooth on songs like “Face the Music” as they’re “runnin’ away from the blues.” Half of the tracks also feature guest 5-string fiddler Rob Hecht. Their eclectic, well-arranged music is really anything but “too blue” because they convey many moods, and abundant amounts of soul and emotion. Too Blue succeeds by giving living, breathing character to their tunes. With nine originals and three covers (originally released by Karla Bonoff, Patsy Cline, and Joe Jackson), the band will gain even considerably more attention if they continue to play with their characteristic naturalness, depth and expression. Self-penned instrumentals such as “Twister”, “Turnpike Reel”, and “Grace’s Fancy/Murphy’s Rag” show just how nimble-fingered and proficient these pickers are. The album’s Grismanesque closer, “Mice in the Camper” illustrates clearly how well they collaborate and blend. Usually playing a 1962 Martin D-18 guitar, Betsy Rome even switches to her Gitane DG-255 on that number to give it a distinctly gypsy jazz feeling. The witty title cut, as well as a cover like “How Long Must I Wait For You?” also emphasize that the band is much more than a bluegrass group. Too Blue has been together for over a decade, and this is their second album. One could say that their honeymoon excursion is over, and I’d highly recommend you get on-board their train to check out their tasty swing-grass music. They now play at many festivals and events in the northeastern U.S., and I hope to see them touring further afield in the near future. For further information on this group visit their website. North Carolinan brothers Josh (guitar) and Wayne (bass) have been singing and playing bluegrass for over forty years. They called themselves The Blue Ridge Mountain Boys in the early 1970s. From 1975 until they formed their own band about 1991, they worked with legendary banjo player Raymond Fairchild. During the late 1990’s and 2000’s, The Crowe Brothers released some stellar albums on the Copper Creek, King and Gusto labels. 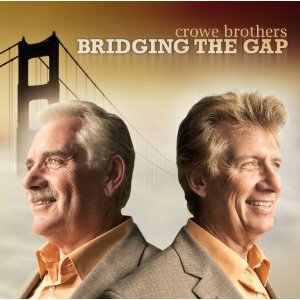 Associated with the Rural Rhythm record label since 2008 when they put out their “Brothers ‘n’ Harmony” album, The Crowe Brothers continue to display remarkable powerful music in fine brother duet fashion. Their second CD on that label shows that they’re still able to present a sound that is both traditional and contemporary. They find good songs from decent songwriters, and Josh even contributes three self-penned compositions (I Knew It Wasn’t You, Grandma’s Little Boardside Cabin, The Winds are Blowing in Maggie Valley). His songs wistfully tell of love, winsome thoughts, and carefree life in Maggie Valley. It’s an old style of bluegrass, but it has a unique contemporary and spiritually-tinged flair. 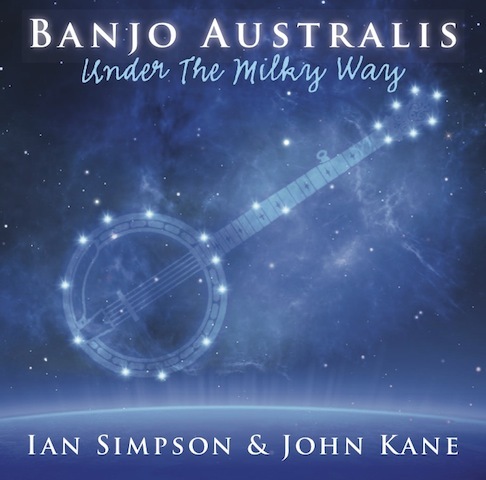 The instrumental accompaniment is first-rate with experienced veterans Steve Sutton (banjo), Brian Blaylock (mandolin on 9 cuts, lead guitar), Steve Thomas (fiddle, mandolin), Ashby Frank (mandolin on 3 cuts), Randy Kohrs (Dobro). The charm of two brothers singing together with sincerity and honesty is what we’ve come to expect in unassuming, leisurely songs like Steve Watts’ “If It Takes More Than Love to Hold You.” The lively barn-burner “I’m Going Back to Old Virginia” shows another side of The Crowes. Strangely, the CD jacket does not provide songwriter or publisher credits for that song, as well as “Southern Moon.” The former was originally recorded on the classic Josh Crowe & David McLaughlin 1994 album, and I’m informed that it was written by McLaughlin. All in all, everything fits very nicely on this harmonious album. Blue Highway performed its first gig on New Year’s Eve in 1994 with its original lineup that includes the same consummate musicians that comprise the band today: Tim Stafford (guitar), Wayne Taylor (bass), Shawn Lane (mandolin, fiddle, guitar), Jason Burleson (banjo, guitar, mandolin), and Rob Ickes (Dobro, lap steel). Tim, Wayne and Shawn provide the vocals. Their early years found them associated with the reputable Rebel record label. 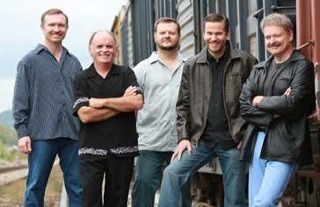 In 1996, Blue Highway won an IBMA award for Emerging Artist of the Year. In 1996 and 2006, they were recognized with IBMA Album of the Year awards. In 1997 and 2004, they won IBMA awards for Gospel Recording of the Year. What a treat to hear a band with such a stable and solid lineup so full of talent. The internationally renowned quintet has now been associated with Rounder Records for over a decade. 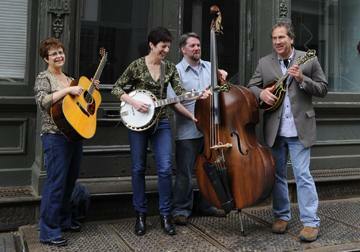 Over the years, Blue Highway has carved out their niche in bluegrass. Their musical vision has always incorporated accessible melodies, bright lyricism, and interesting dynamics. Sounds of Home is noteworthy for its all-original emphasis, with the exception of the public domain cover Nobody’s Fault But Mine. Taylor, Stafford and Lane’s songwriting abilities are showcased. Burleson also penned a snappy instrumental Roaring Creek. The band’s considerable emotional depth shines through on moving songs like Storm and Drinking from a Deeper Well. The former has us looking inward “to see the dawn when the storm is gone.” The sorrow of a generic mining disaster is captured in the mournful ¾-time Only Seventeen. Every band has a few unique signature arrangements we have become accustomed to, and Shawn Lane’s solo vocalizing on I Ain’t Gonna Lay My Hammer Down is an example that opens the album. One thing I miss here is a Wayne Taylor/Shawn Lane brother-style duet, as well as a Bluegrass Highway a cappella vocal arrangement typical of some we’ve heard on earlier releases. But, it always delights me when they use solid tried-and-true traditional messages to craft contemporary songs like Bluebird Days and Restless Working Man. No Blue Highway album would be complete without a solid story song, and they masterfully fill that slot with Heather and Billy, co-penned by Tim Stafford with Steve Gulley, about a couple with a great amount of love and compassion for children in need. Their musicality and approach are simply able to covey many aesthetic moods, along with considerable respect and depth. 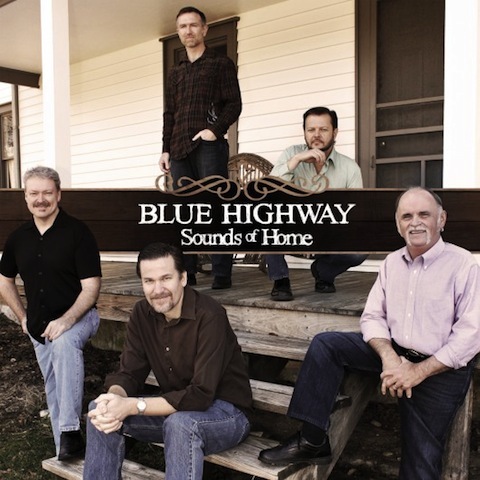 Blue Highway boasts an impressive track record as a contemporary bluegrass band, and the musicians individually as award-winners. They’ve released ten highly-acclaimed albums, been nominated for two Grammy awards (in 2004 and 2005), topped the Bluegrass Unlimited chart, won a Dove Award in 2004 for Best Bluegrass Album (Wondrous Love) and taken home over a dozen IBMA and SPBGMA awards (either as a band or individually). Sounds of Homeillustrates why Blue Highway has a well-deserved reputation as one of the most lauded groups in contemporary bluegrass music today due to their brilliant instrumental virtuosity, soaring harmonies, driving rhythms, well-crafted original material, and creative arrangements.